The Zambia Centre for Interparty Dialogue (ZCID) has insisted that it will go ahead with its national dialogue process. 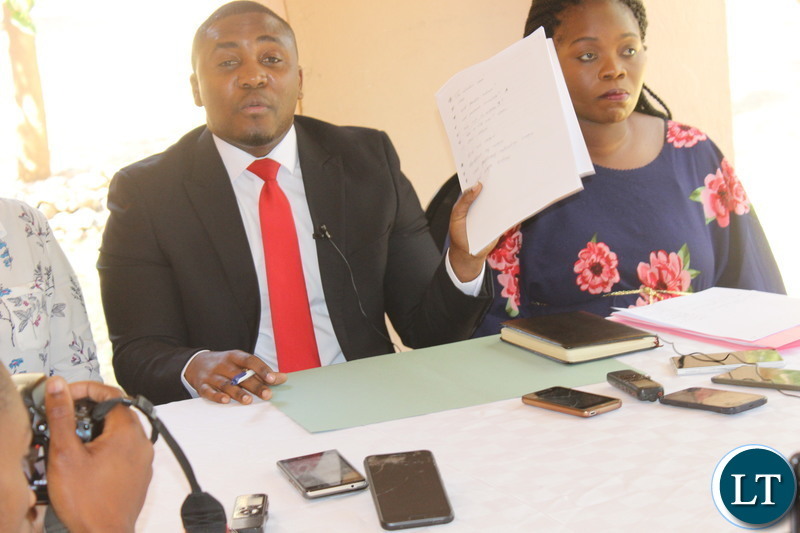 Spokesperson Jackson Silavwe said the ZCID is resolved to follow resolutions made by Secretary Generals under the conglomerate of political parties that met in Siavonga recently. Mr. Silavwe said the Church is being malicious to disregard these resolutions. He told QTV News in an interview that the ZCID also found the recent statement issued by the Church to have lacked merit. Mr. Silavwe said the Center does not however want to seem to be in a tug of war with the Church. “Mr. Silavwe said the Center does not however want to seem to be in a tug of war with the Church.”- OK GOOD STATEMENT, if that is case, COULD YOU PLEASE MEET WITH THE CHURCH AND IRON OUT THE DIFFERENCES?!! It is this type of LACK OF DIALOGUE THAT BROUGHT IN OUTSIDERS LIKE THE COMMONWEALTH TO REMIND US OF THE NEED TO LISTEN AND TALK TO EACH OTHER!! So far we alot of time and energy is being lost in “cheap publicity” at the expense of advancing the important cause! WE WANT THE DIALOGUE PROCESS TO ACCELERATE CONSTITUTIONAL,ELECTORAL REFORMS and LAWS THAT SEEM TO HAVE POTENTIAL FOR PROMOTING BAD GOVERNANCE!! How can these idyots mediate a dialogue when they are busy insulting the Church everyday? Close that ZICD, who formed that thing? Looks like we need someone to facilitate dialogue between the facilitators of dialogue, the Church and ZCID!!! In your country. Dirty, lacking staff and everyone looked dejected from the cleaner onwards. This country is a joke. The answer to the problem is to omit ZCID from the dialogue process. It’s as simple as that. This chap JS, I bet he thinks that he’s Michael Jackson, is a joke. How can the church that’s built on the platform of honesty, thy shall not kill and all that, be malicious? I know that some priests and prophets are fake but make such a umbrella statement in blasphemous. In some religions the guy wouldn’t live to see another day. Retract the statement boy. @Mushota don’t be stup!d with your Nick who lives in council estates and scumbag. The hospitals in the UK are infested with MMR and I dread to even go there. What are you on about? You’ll just end up coming back alone crying. Your fellow holes will dig their teeth and ar$es into your kama Nick of yours. Fuseki. Sorry, to make such an umbrella statement is blasphemous. Ka Mushota who is your statement directed at, since you have full of praises for wamuyayaya? Is it by choice that you choose to be constantly inconsistent? Ati “passed at UTH” chibwana chakwesa, Scotland? The crocodile shades off it’s sheep skin. Emmerson Mnangagwa has appointed a Commission of Inquiry to inquire into “The Post-Election Violence on the First of August 2018”. While some, like Theresa May (British Prime Minister), who has made her views known, will see this as a pledge well kept, there are FOUR fundamental wrongs with the Commission! So the first fundamental wrong is that by acting like a King, Mnangagwa has violated s110(3) of the Constitution. He can’t appoint a Commission of this nature without the advice of Cabinet & without a responsible minister to oversee the Commission & facilitate its work! … Cabinet whose advice was necessary in terms of the Constitution. Mnangagwa, who stole the election, thinks he can do decrees like a King; just like that! It’s very clear that one of Mnangagwa’s major reasons for rushing to appoint this Commission, without a Cabinet in place, is to fix Chiwenga, with the help of @CatrionaLaing1, to weaken his hand in cabinet selection & to later oust him. Chiwenga is certainly on the ropes! The third thing that is fundamentally wrong with the Commission is that its terms of reference, whose authorship is unknown, are accusatory when they should be open ended for fact-finding purposes. This renders the terms of reference to be self-discrediting & thus political! … to the 1st of August, 2018 post-election violence”. How about the Harare Massacre & the subsequent 10 day siege of townships where residents were brutally tortured & some abducted by the Army? Smh! The second term of reference says “to identify the actors & their leaders, their motive & strategies employed in the protests”. How about the need to identify the soldiers who bayoneted, beat up, tortured civilians or shot them in the back; their strategies & orders? Please! The second fundamentally wrong thing are the Commission’s terms of reference. Whose are they? Who drafted them? Mnangagwa? @CatrionaLaing1? UK govt? When @theresa_may praised Mnangagwa on the Commission in SA yesterday, did she know something that Zimbabweans did not know? Term of reference (d) on page 2 says “to investigate the the circumstances which NECESSITATED the involvement of the military in assisting in the maintenance of law & order”. Who says the involvement of the military was NECESSARY? This term of reference is a conclusion! It’s notable that while Mnangagwa’s chief election agent, Ziyambi Ziyambi, barred @AdvDali_Mpofu & his colleagues from representing @nelsonchamisa in the ConCourt on xenophobic grounds that they are aliens, Mnangagwa has appointed a Commission whose majority are foreigners! Term of reference (f) refers to “extent of damage/injury”. This is outrageous. It’s criminal… Mnangagwa is mad! So Mnangagwa’s Commission is unconstitutional. It’s composition is a scratch-my-back I scratch-your-back affair. And its terms of reference are political & corrupt. In effect, the Commission is not designed to achieve justice; which is the cry of the victims & the people. Yes,the church had become malicious. Look at the people speaking on behalf of the church they were partisan at one point. The likes of mususu!The political parties themselves need to iron out this!Other so called big political parties have broken the peace agreements made in the past! This is what happens when you start something without clearly defining the problem and objectives. If this dialogue is about lungu and hh, why is it being called national? If it is about or includes resolving constitutional issues, why restrict the dialogue to political parties only? What exactly do they want to achieve from this dialogue? The problem is u5 telling his followers ati bandibida. Its not bandas. “Our elections were free, fair and credible, which no one in his/her rightful mind can criticise and the legitimacy of the election of President Mnangagwa can, therefore, not be questioned,” said political analyst Mr Gabriel Chaibva, in a Chronicle report. The guilty need no accuser! Chaibva is fuming and frothing at the mouth defending an indefensible position! Like everyone else, PM May would have been astonished to hear that ZEC failed to produce a clean and verified voters’ roll, for example; a must have in any election and a legal requirement in Zimbabwe. She then heard of 16 polling stations in which two or more neighbouring stations had exactly the same number of ballots cast and President Mnangagwa had received exactly the same votes. One does not need a degree in mathematics or anything to know these were bussed voters casting multiple votes. The reason why ZEC had refused to release a verified voters’ roll is immediately obvious, it would have been the smoking gun to the blatant vote rigging taking place! Even if nations like Britain never come out and openly condemn the flawed and illegal elections in Zimbabwe, choosing to dwell on the side issues such as the 1st August violence; their silence has said it all. The foreign investors and lenders KNOW the elections were rigged. Sadly, the much hoped for flood of investors will never happen because investors do not do business in pariah state ruled by vote rigging thugs! The investors will never be fooled into believing Zimbabwe is a democracy when they can see with their own eyes the blatant vote rigging and thuggery! You can fool the blind on fufu (cassava or yam) but not on extra hot chilli in the relish. U5 lost. dialogue for what. This just a chamisa case. Young man don’t hold the country at ransom with your childish ego and personal motives. What powers does the ZCID have to make the PF abide by the outcomes of the dialogue process? The Church can exert pressure on any party which may not respect the outcome of the dialogue process because of their numbers and the support the enjoy both locally and internationally no wonder some parties are against the church. What can ZCID do other than calling for more and more dialogue for the sake of allowances. I hope there will be no allowances but only water and snacks for the participates. When you see that just know there is cash – kobili – involved! Everyone wants in on the trough. Forget labels ati zcid, church, cani-cani. Ni lye cabe apo. Otherwise this useless dialog would have taken place a long time ago. Ifyabupuba fye. Wasted Lungu years indeed…a Mayor is manhandled kiddnapped by thugs calls Home Affairs Minister to send police to assist, both the lazy inept President & senile Veep are out of town campaigning whilst economy is going downhill, then these bunch of thirsty thugs are hell bent mediating talks….clear lawlessness. The Church want an immediate dialogue with all political players. ZCID, just want meeting after meeting for allowances, the act and have learnt from UPND lawyers. Just like they delayed in filing for a petition to the 2016 elections knowing that they will be paid for years by clueless HH and GBM. These guys will start petty squabbles and make up new talk dates for money to continue pouring in. I am tired of politics. Let’s develop Zambia too much talk. Lets invite the British back to rule us. Kabili kulibe chichitika. The only one working now is Bowman. He is all over trying to push the right mentality among Zambians. Though I have never liked his bootlicking attitude, his change in style deserves recognition. Invite the British to rule your wife and relatives, if you have failed, do not blanket that existence on all Zambians. The Zambia Revenue authority is making profits and dividends etc. If you have nothing constructive to say, stay silent. Can you please clarify “…The Zambia Revenue authority is making profits and dividends etc. …”? ZRA making profits and dividends? WTF are you crapping about? Do you know what? I am getting fed up of LT. The so called NEWS MAKERS are just ar$*es then we have people like Mushota who talk trash then in the end they’re celebrated as BB 2014 and all that. They also claim to fight for justice yet they diss the motherland when they are with their worm-cork boyfriends. Then we have big and hot-headed Mumba who thinks he knows everything. You know what. Go back to Zambia and stay there. Stand up and be counted for your country. This palaver ain’t gonna help nobody. I HAVE NOW COME TO REALISE THAT WE ACTUALLY DO NOT NEED THE DIALOGUE BECAUSE THE REASON FOR THE DIALOGUE IS NOT THERE. WHAT ACTUALLY IS OUR PROBLEM? WE HAVE HAD CONSTITUTION MAKING PROCESSES AND HAVE YIELDED NOTHING. AND AGAIN DON’T SAY THE CHURCH IS MALICIOUS FOR IT IS THE BODY OF CHRIST. HOWEVER IT IS THE THREE LEADERS OF THE THREE CHURCH MOTHER BODIES WHO ARE BEING MALICIOUS. No dialogue is required. We just need to weed out greedy people from our society man. People like Lungu and Kaiser Zulu are undesirable elements. I am sick of !diots in our midst. analyser there you go again with your malicious talk. Provide evidence to the ACC that president Lungu is at fault. Their doors are open, if not stop with your slander and call for a conevtion in UPND, a calling of the Lusaka mayor to sanity, and an explanation as to what minister Kampyongo does. That chap called Sikazwe is an imbecile. How old is this boy. Does the chap have any influence to negotiate a reconciliation. Immediately after Mwila PF SG called ZCID to handle the dialogue this chap is back to sing the chorus of Mwila’s song. I have a lot respect for the church especially the catholic. This a church which is self sustaining and does not need any handouts like the so called ZCID. Look at how they brought KK to reality to agree to multiparty politics, how they brought Levy and Sata at the Cathedral of the holly cross to shake hands without a begging bow of allowances. This is chap has chewed something and he needs to pay back his master Mwila what he has eaten. It’s not the church but ZCID who is being malicious here. Why are they insisting on a dialogue now. Where were they all this time? Be careful what you say against the Church. You may eat your words. Just wait….this young Boy and his ZCID will soon be running to the church for help. What relevant experience does ZCID have compared to the Church? Stop this BS. I almost said that was blasphemy!